A project can be called innovative when no comparable system exists, and it can be classified as very challenging when even the client is not sure if the solution will be possible. More than a dozen of projects carried out by GEPARD were innovative and challenging. And all of them were successfully completed (see selected projects below). GEPARD has a long-term reputation for finding a solution to really challenging problems. This reputation has already raised a number of technically and scientifically highly interesting and innovative projects. But also 'standard' developments took benefit from the creative approach of the team. All ESA / EUMETSAT contracts described below comprise the development of various sophisticated and innovative image processing systems. They have been implemented on parallel computer and standard UNIX systems. Several products have been derived from the space contracts. For instance, the CineSat display software for Sun stations, and the initial version of the CineSat Nowcast system for short-range weather forecasting. Transputer based prototype to demonstrate the benefit of parallel computing technology to space applications. The selected demonstrator applications included high-speed satellite image display and real-time satellite image processing. Development of the world's fastest parallel display system for high resolution Meteosat images (5,000 x 5,000 pixels). Interactive film-like animation facility for hundreds of these images including real-time zoom and pan and color manipulation even during running animation. 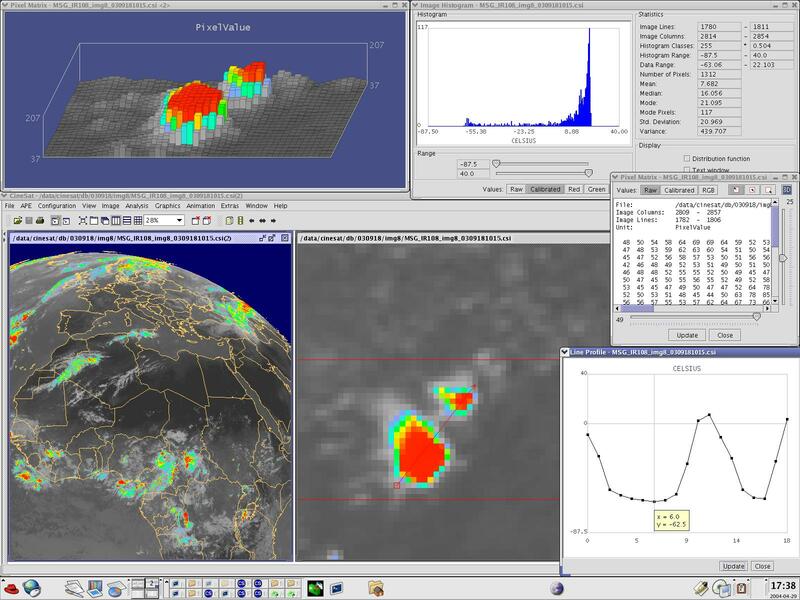 The developed TAW (Transputer augmented workstation) also included real-time Meteosat image rectification, i.e. the geographical correction of raw satellite images in the ESA ground segment prior to dissemination to end-users. New rectification algorithms have been developed, tested, and optimized for real-time performance. The world´s fastest digital image display system for high-resolution images, and a new real-time image resampling method tailored to the content of meteorological images. Development of the first real-time wind computer for the European Space Operation Centre, including a full automatic quality control of the computed wind information. Additional software development for several meteorological products that are derived from image data, like Upper Tropospheric Humidity, Total Column Water, Wind Trajectories, etc. For the first time ever, meteorologists had half-hourly cloud motion winds available for the full Meteosat Earth disk. The delivered system computed the information in 10 minutes (!) compared to the 4 computing hours of the previously existing wind processing. The speed-up could be achieved by utilizing a specifically designed parallel computer platform (i860 / transputer). A surplus factor of 16 in speed could be gained by new and highly efficient mathematical algorithms. The system also features a fully automatic quality control of the computed wind field. Implementation of an on-ground correction software for Meteosat-5 images being distorted by a rotating lens in the satellite´s imaging system. The Meteosat-6 radiometer is severely affected by an irregular anomaly of unknown source. Two of the three image channels have their brightness levels distorted from line to line in an unpredictable way. The temperatures measured by this satellite differ up to 25% (more than 15 degree Celsius) from ground measurements and the reference satellite. GEPARD was the only company to successfully propose a solution for the on-ground correction of the Meteosat-6 radiometer anomaly. Meteosat-6 infra-red image with a radiometer anomaly. The image is nearly ok at the South pole, but becomes brighter in the North. In this example Meteosat-6 measured a sea surface temperature of 5 degree Celsius in the Mediterranian sea during the summer season ! The correction does not affect the usual daily temperature variations. The anomaly is completely irregular. Neither the shape of the North-South anomaly nor the existence of an anomaly could be predicted from one image to the next. After several months of international investigation it turned out that the source of the Meteosat-6 anomaly could not be identified and that there is no proposal for an on-board fix of this problem. Based on some very promising preliminary tests at GEPARD, ESA commissioned us with a feasibility study for the on-ground correction of the anomaly. Within a few months, we took the steps from a successful offline demonstrator prototype to an operational, real-time correction facility, smoothly integrated into the EUMETSAT ground segment. GEPARD developed algorithms and software that corrected the unpredictable radiometer anomaly of Meteosat-6 in real-time and with excellent accuracy - compared to a reference satellite. Real-time performance: image correction is done while the satellite is still transmitting the image lines to the ground segment. End users did not recognize any changes in product quality when operation switched from Meteosat-5 to Meteosat-6 - although the raw images provided by Meteosat-6 were severely corrupted. Even better: The M6C correction method turned out to be a valuable quality control tool for satellite imagery. It also revealed a slight anomaly problem with Meteosat-5. Algorithm development for the combined analysis of satellite images, numerical model, and measurement data. The approach is based on fuzzy logic methods and can also handle the time and position offsets between the various data sources. The software demonstrator included the successful testing of this approach with Meteosat infra-red images and numerical weather prediction models. The developed approach forms now the basic framework for a real-time system that automatically identifies weather phenomena and cloud configurations. Survey and prototype implementation of algorithms suitable for the automatic classification of forest damages from airborn infra-red images, and of image pre-processing techniques that assist the human interpreter. 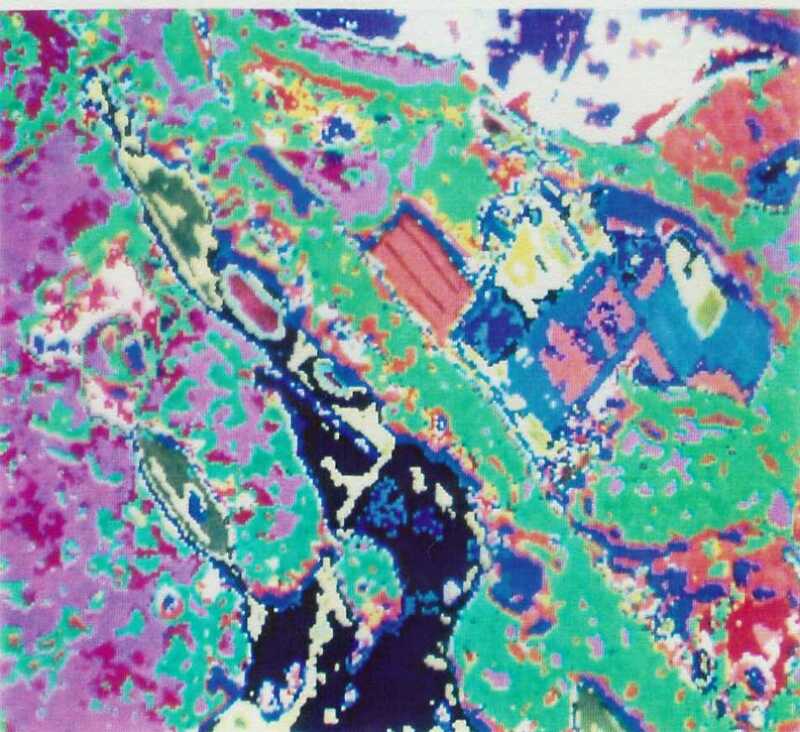 Operational software for multispectral Landsat image classification on a parallel computer platform. Method and system development for the joint automatic analysis of Meteosat images and numerical weather prediction models. The main focus in this project was on image analysis, in particular the identification of cloud textures, structures and configurations, and the recognition of special cloud objects like convective cells, S-forms, waves, spiral structures, fibres, etc. The project has been partially funded by the Austrian Federal Ministry of Science and Transport. Two other projects contributed to this development - ASIA and CCELLS. More than 50% of the project has been financed from own resources in view of future sales. The system is currently in operational use at ZAMG and other weather services for the automatic real-time detection of so-called 'conceptual models'. CMs are a classification of weather phenomena in terms of their appearence in satellite imagery and associated numerical weather prediction parameters. 30-40 models are currently automatically identified every 15 minutes. Two projects concerning the feasibility analysis and prototype implementation of methods for the automatic detection of convective cloud cells. Results have been incorporated in the CineSat software. CineSat is a powerful, high-performance, and feature-rich meteorological software suite for satellite image analysis, display, and processing. It features a real-time weather analysis and forecasting module based on satellite imagery, a high-performance and highly-configurable Automatic Product Extraction Server with a number of unique functions, and a strong and fast data display. 25 years ago, CineSat had started as an in-house research and development project, initiated by customer requests for a high-performance satellite image interpretation system. Designed to best possibly assist the forecaster's operational routine work. With start of Meteosat 2nd Generation in 2003, CineSat became a well appreciated standard software solution for real-time processing of meteorological data distributed via EUMETCast. PC-based image analysis system for recording, storage and interpretation of video images. The system is used for the measurement and documentation of limb positions and angles in video images of human bodies. Feasibility study and design of a system for real-time quality control of the color printing on plastic tubes (e.g. for tooth paste tubes). White tubes are being heated over a flame and then pressed against a high-speed printing wheel which applies color prints on two tubes per second. The main challenge in this project was that the color printings have to be controlled with an accuracy of about 1/10 mm while the tubes are deforming (cooling down) during rotation in front of a line scan camera. The line camera produces about 18 MB of RGB image data per tube. This means that 36 MB of randomly deformed image data had to be controlled with pixel accuracy within a second). A number of customer and application specific feasibility studies and system designs for the automatic quality control of various products, like cables, wood, electronic and electric parts and devices, metallic vehicle parts, medical images, prints on product surfaces, textiles, etc. Great echo on GEPARD´s 'Dream Fabric' at the world's biggest industrial fair. Simulation of production processes with real-time interaction features and high-speed, real-world image animation (25 images per second) on a parallel computer. Two projects concerning modelling, simulation, animation and optimisation of the monitor and TV tube production lines. The client successfully restructured his manufacturing line according to the results of this optimisation analysis. The simulator can react to digital and analogue inputs in real-time by using external signals as input to the simulation model and outputting digital and analogue signals from the model to an attached device (hardware-in-the-loop simulation). Its application ranges from complex factory process simulations, high-performance animation display with 25 images per second, to high-speed test beds (hardware-in-the-loop simulations) for devices. 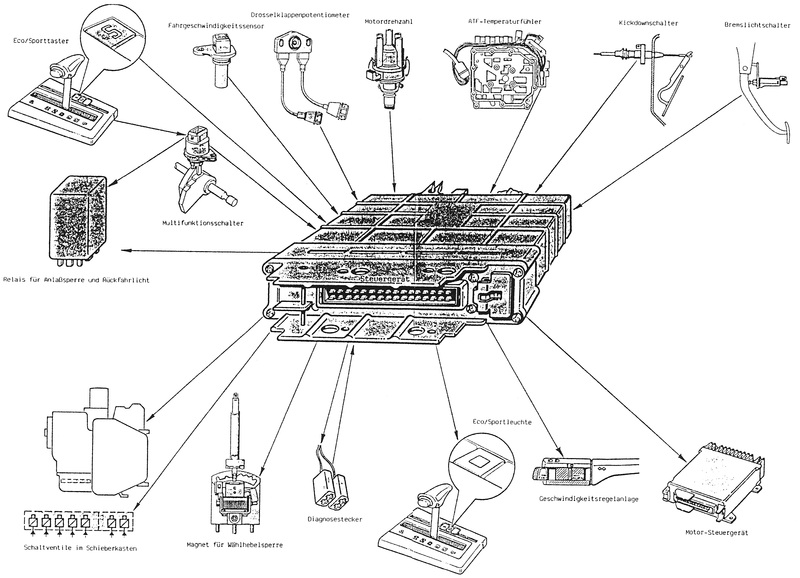 The system was used as basis for several customer specific development projects (see below). The customer had already developed the simulator software for all major components of a steam power plant. Our staff developed the mathematical framework and software that solves all issues when - during the design phase of a new power plant - different components are being plugged together and simulated in order to optimise the efficiency and performance of the projected plant. In particular, it solved all zero-search and steady-state problems related to the typical circular flow of water and steam through the component arrangement. If you drive on the highway full speed, what will happen if a signal cable breaks and your gear control does not get information about current speed ? Will it change down to first gear ? Or even go to parking mode at 100 miles per hour ? Thorough testing of the device logic will protect your life. event driven models of cable breaks and other critical situations, as well as real-time interaction via mouse, keyboard, and analogue and digital signals. It utilises high-performance real-time digital and analog IO-processing hardware for interaction between the simulation computer and the connected electronic device. The system reads the device's signals, simulates the motor's and the car's reaction by solving 50 complex differential equations more than hundred times a second, and feeds the external device again with analog and digital signals from simulated car sensors (Hardware-in-the-Loop). Before having this test bed available, engineers at Volkswagen had to perform about 30,000 km of partly dangerous test drives per year to test the gear control device under all possible stress and fault situations. With this powerful tool it became possible to fully automate these test procedures without further affecting the safety of test personnel. Customer specific design and production of a high performance parallel computer system including fast analogue and digital IOs to control a large flight simulator centrifuge. 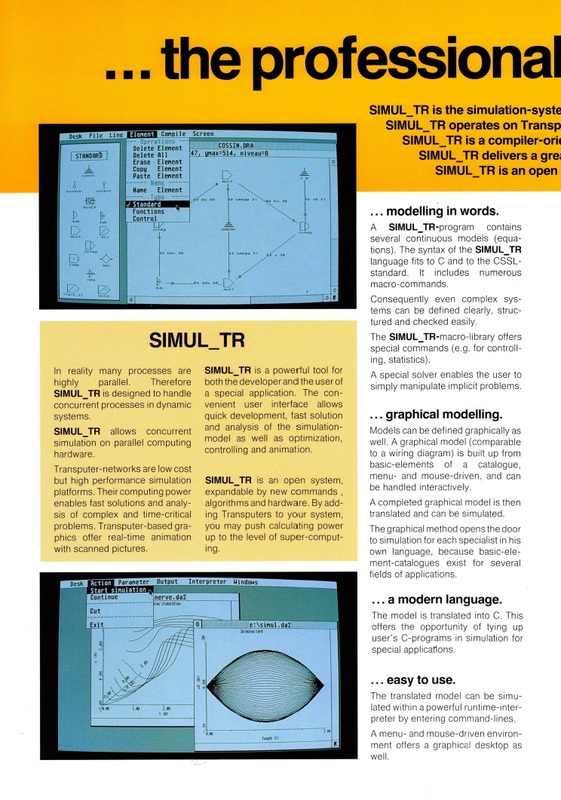 Real-time simulator (SIMUL_TR) with a number of analogue and digital IOs that can be connected to various electronic devices of the customer. The device environment can be specified by a fully featured standard simulation language. 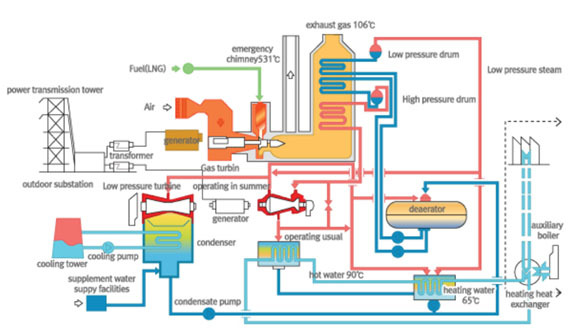 Simulation software for computation of SO2 and NOx emissions caused by a single power plant. The simulation models and parameters have been deduced from more than 40.000 measurement data and implemented on a parallel computer. Feasibility study for aerosol transport simulation on a parallel computing platform. High performance simulator for emission control and immission forecasting for the Austrian city of Salzburg. The project required to simulate the impact on ground pollution of the emissions of approximately 600 single sources and of 1,000 area sources. The impact on 76,000 points of the city´s territory was calculated for each half an hour of the year, i.e. for 17,500 meteorological situations The computing had to be performed in two steps; first, to compute the base immission situation (data base) for a complete reference year. Secondly, it is frequently used for urban development decisions, to evaluate the expected impact of new emittents under selected meteorological conditions. The estimated time for computing the immission data base on a standard mainframe computer in 1988 was 2.5 years. This could be reduced with the delivered simulator (parallel computing hardware) to about 14 days. The impact of new emittents in a specific meteorological situation could be computed within half a second. Due to this excellent performance, the system could be used as an interactive urban planning tool.